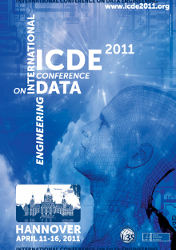 The registration fees for the participation at ICDE 2011 are listed in the following table. Note: Authors must register by 10. January 2011 (extended to 14. February 2011). One paper submission per registration. Participants can register online through the conference registration system (preferred, see the link below), or alternatively with the registration form, which can be downloaded from this page. It is acceptable to have a co-author register for a paper even if another co-author will present it. In this way, if author A has paper 5 and 10 and he is presenting both papers, it is OK for A to register for paper 5 and for another co-author who will also attend the conference to register for paper 10 even if A will present both papers 5 and 10. However, if one author is registering to present multiple papers without any coauthor attending, there will be an additional fee of 200,- € per additional paper that single person will present. Attendees can opt to pay at the conference registration desk by credit card. The registration desk opens every day at 8:00 am. There is also the possibility to buy tickets for the reception (35,- EUR) and the banquet (50,- EUR). Those participants who need to apply for a visa should begin the visa application process as soon as possible. Information for obtaining a visa letter from the conference organizers can be found here. Attendees requiring visa assistance letters must send an email to reg-icde2011@L3S.de with the subject line “IEEE ICDE2011 Visa Letter Request”. There will be a penalty of 15% of the registration fee (minimum 40 €) for cancellation. Cancellations will be accepted until 1 March 2011. No refunds will be honored after this date. If you cannot attend, your registration may be transferred to a colleague by giving a letter of authorization. Email such request to: reg-ICDE2011@L3S.de.